Colored lights. Holiday music. Television specials. Peppermint-flavored everything. Coca-Cola commercials. The Christmas season is here, and along with it comes another opportunity to do something awesome. 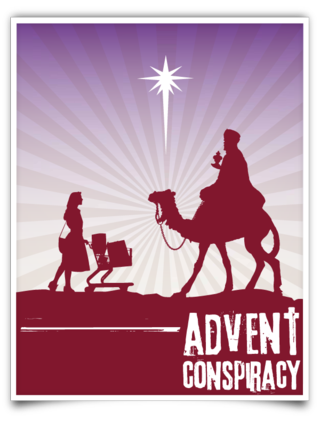 I wrote last year about the Advent Conspiracy, an initiative inspired by three simple facts. 1. Americans spend $450 billion on Christmas every year. 2. Lack of clean water kills more people every day than almost anything else on Earth. 3. The estimated cost to make clean water available to everyone on Earth is about $20 billion—roughly 4.5% of how much Americans spend on Christmas every single year. A few years ago, someone asked the question: What if we spent a little less on Christmas stuff and gave the extra money to projects that provide clean water? Those shoes and DVDs and extra holiday decorations and all the other stuff that spends most of its existence gathering dust in a closet or on a shelf—these things can become life, health and hope for people in poor countries. I usually dislike churchy videos, but this one is amazing. Watch it. Go on, I’ll wait for you. There’s nothing wrong with giving and receiving Christmas presents. (I’ve already purchased one or two gifts for family members.) The challenge of the Advent Conspiracy isn’t to stop spending money for Christmas, but to spend less on stuff and more on people in need. We don’t have to give up our Christmas traditions. Quite the opposite! I think it’s time we add new traditions to our celebration of Christmas: spending less, donating more, giving water, saving lives. The Advent Conspiracy is dedicated to providing clean water, but its principles can be applied to other good causes. The hungry, the homeless and the brokenhearted need our money as much as the thirsty. Where we give doesn’t matter as much as whether we give. This Christmas, we can rescue people from poverty, thirst and sickness. This Christmas, we can change the world—or we can buy more stuff for ourselves. It’s our choice. Have a truly glorious Christmas season! This entry was posted in Faith, Life, the Universe, and Everything and tagged Advent Conspiracy, Christmas, crazy idea by Adam Stück. Bookmark the permalink.